How to test your VPN? What does the new EU geoblocking policy mean for Europeans? 5 Euro VPN Review 5 Euro VPN understands what VPN users are looking for: reliability, privacy, speed, and good pricing. Great service, great price. Curaçao - Not a Fourteen Eyes Country AND Not an Enemy of the Internet. 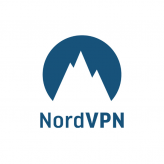 5 Euro VPN understands what VPN users are looking for: reliability, privacy, speed, and good pricing. The service may be new to the VPN market, the company behind it seems to have launched on the basis of a solid server setup. Covering every important region with surprisingly high internet speeds. There’s no discernable pinching of VPN data, there are no data limits, and customers can connect as many devices as they like. Which are exactly some of the more common annoyances in other services. At the moment of writing most servers are operating in Europe, with Germany, the UK, France, and Holland as the main hubs. Together with servers on North-American soil, this allows for an easy approach to most popular streaming services. Asia and Oceania are represented as well, with servers located in Japan, Australia, and Singapore. We haven’t been able to test them, but Western users should expect slightly lower speeds due to geographical distances. A VPN setup has to be quick and easy, especially for users new to the business. For them (and also for more experienced users) an app that preselects security options or servers is a big plus. The 5 Euro VPN desktop app certainly has you covered: it excels in user friendliness, has a pleasing, clear layout, and allows you to manage important functionalities with a few clicks. After a simple setup process, users enter their activation key and are ready for their anonymous browsing business. Important security protocols are active by default, so there’s no need for tweaking if you don’t feel like it. Of course the app allows users to alter any setting through its options menu. We were charmed to find settings that optimise your VPN for things like Bittorrent or streaming – choosing these options yields presets to the right servers and settings. Streaming content from regions that are not your own is very easy. European users who want to check US Netflix (or one of the many other streaming services not on their local menu) don’t even have to log into a US server. 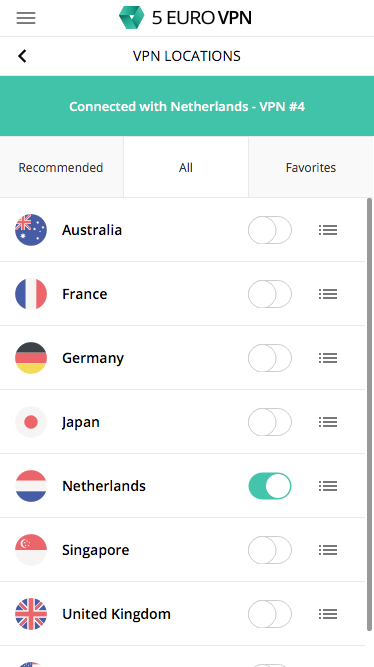 5 Euro VPN’s use of SmartDNS connects European servers to American services without hassle, and vice versa. This striking feature makes 5 Euro VPN unique amongst its peers, putting them ahead of other (slower or more complicated) services. Making it one of the best VPN for Netflix. A mobile app with the same features as the desktop version is on its way. Also interesting are Linux and Kodi versions, scheduled for release after the iOS and VPN for Android apps are live. 5 Euro VPN uses smart DNS to smoothly sail past geoblocking. As mentioned above, this is a unique approach, setting 5 Euro VPN apart from most other VPN providers. This means easy access to any Netflix territory, but also Hulu, HBO Now, Crackle, ABC, NBC, PBS. You’ll need a working login to watch the content, but no other VPN provider offers such unprecedented access to so many streaming services, independent of your whereabouts. Average speeds for 5 Euro VPN’s service are very good. We didn’t measure any heavy delays, which isn’t often the case when a service applies heavy encryption tools, like 5 Euro VPN does. There’s no pinching involved, no matter how many devices you use at the same time, ensuring high speeds even when downloading through Bittorrent. Other services tend to limit the number of devices you can connect, restrict the maximum speed or have data limits, but 5 Euro VPN doesn’t, making it a fairly unique service in this price range. It’s basically a premium VPN service for a budget price. Geographical distances influence speeds, of course, but for most users this isn’t too big a factor – you have to be an IT expert to tell if your foreign Netflix show is buffering slower than it should. In video gaming latency is a factor, and European gamers will experience lag if they play on American servers, and vice versa. Importantly, 5 Euro VPN offers a stable connection throughout. There’s no pinching, no data limiting, which is surprising in a service that has no restrictions on the number of devices you’d like to connect. Speeds in Asia and Oceania are fairly good too, considering the general quality of server parcs in the region, and the distance data travels from one server to the next. Western users will use these servers mostly to do online shopping and flight booking, which don’t require top speeds, so the problem is manageable. Looking at the price to quality ratio, 5 Euro VPN offers an amazing deal. 5 Euro VPN offers unlimited access to VPN servers for a mere €5 per month. With no limit to the number of devices you connect at the same time. This means your entire household can be safely online on this budget. 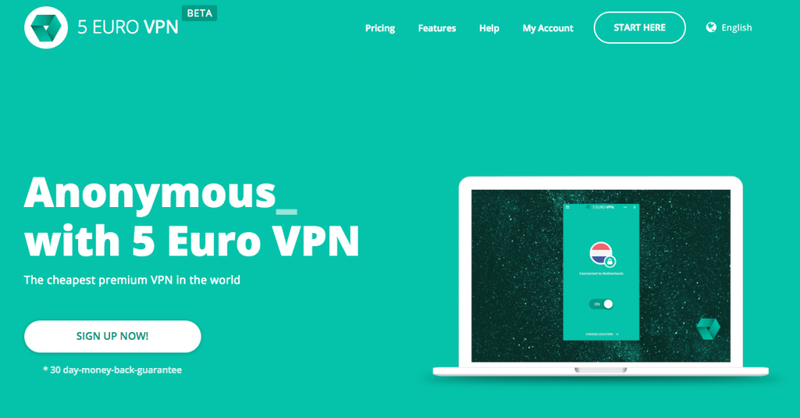 5 Euro VPN awards users who opt for longer contracts with monthly pricing as low as €3.75 for one-year contracts, €2.99 for two, and a staggering €2.50 for three-year contracts. Also on offer is a free trial period, and a 30-day money-back guarantee if you don’t like the service after trying. Summarizing: any free VPN service (operating on deals with many caveats) will have a hard time competing with these prices. In this respect, 5 Euro VPN sits comfortably between the cheapest services. While offering a deal comparable to some of the most premium VPN providers. The low pricing and lack of restrictions on usage offer a strong message to other providers as well. The service is promoted as ‘the cheapest premium VPN in the world’, a statement sure to drop some jaws at the competition. 5 Euro VPN takes well care of their privacy and security.. It runs OpenVPN (the strongest encryption available at the moment) as default system, and supports a SOCKS5 proxy for those who want to check foreign services without lag. To some, this setup may seem pretty basic, but for a basic system it’s quite advanced, especially considering the pricing of the service! If this doesn’t comfort you in your privacy concerns, the company’s log policy will: 5 Euro VPN doesn’t keep logs for your sessions, doesn’t register IP-addresses, logins and the like. The same goes for their DNS server: it doesn’t keep track of who’s logged in at what point, or how many sessions a user has had. These premises go a long way in securing your online privacy. 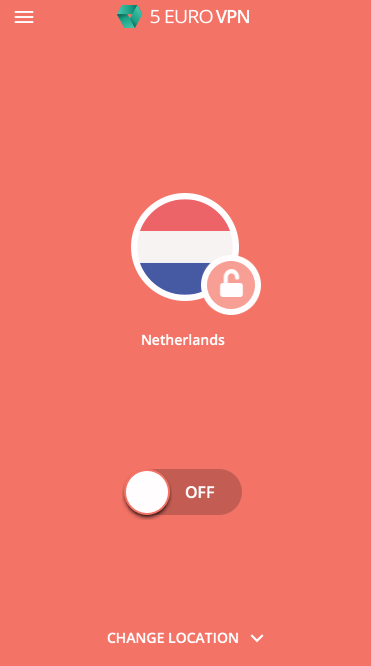 On top of this the app has a kill-switch functionality, ensuring no-one sees your IP if the VPN connection suddenly drops. Needless to say, users should always test if their VPN works properly, to avoid any leaks. 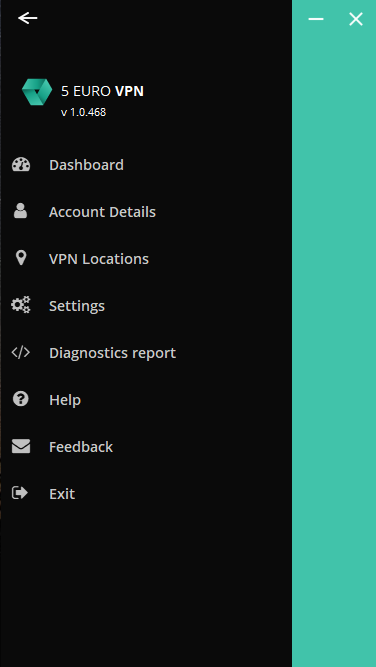 To help you check your setup, we wrote a handy article about testing your VPN connection. The use of Smart DNS makes avoiding geo blocks a piece of cake. Giving 5 Euro VPN users a reliable access to streaming services worldwide. ‘Reliable’ between colons, of course. In the cat-and-mouse between streaming services and VPN providers the odds are the Netflixes of this world will find new ways to reinstate their precious geoblocks in various technical ways. Upping the ante for those who are in the trespassing business. Apart from avoiding geoblocking, 5 Euro VPN offers users the ability to use VPN for Bittorrent on their servers. This is really where the service shines. Downloads won’t be pinched or in any other way delayed (plus you’re able to hook as many devices as you want to your service. 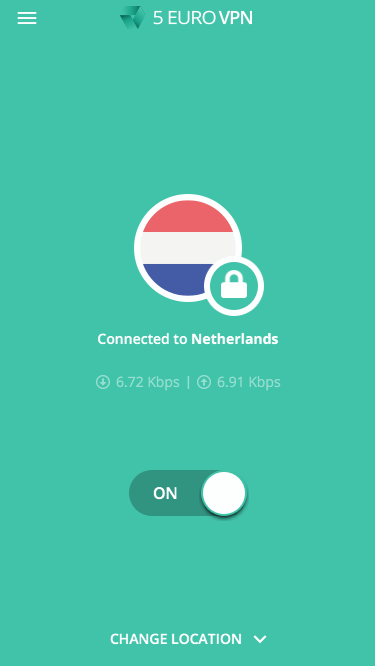 With no effect to download speeds, a unique feature for a premium VPN provider). As mentioned before, installing 5 Euro VPN’s apps and services is a walk in the parc. For those who still require assistance there’s a 24/7 customer support service on the website, and a list of FAQ’s that gets regular updates. The customer support team generally responds swiftly and seems to be well-briefed. 5 Euro VPN has clearly done its bit to make sure your service runs smoothly. Add this to the user-friendliness of the app, and you have a service that probably won’t give too many headaches. 5 Euro VPN has an eye-catching price to quality ratio. The fees are really low for a premium service. Which makes them an interesting party for anyone looking into budget options. At the same time, the service scores on other metrics as well. Its useability and privacy details (encryption) are very recommendable. On top of that the service doesn’t pinch data or imposes data limits. Even the amount of devices you want to connect is entirely up to you. Minor issues are the lack of a mobile app (at the moment of writing, a launch date is expected soon-ish). And the size of its server parc, which is relatively small compared to some of the VPN giants. 5 Euro VPN is well aware of these matters, we learned, and is working on both iOS and Android apps, but also Linux and Kodi integration. As soon as these materialise (and the server parc is expanded), nothing of note stands in the way of success on this crowded market. 5 Euro VPN offers a balanced deal, that, we suspect, was born after carefully studying the competition for best practices. And combining those into a new type of VPN provider. The access price is exceptionally low for a premium service. Users benefit from every important functionality in the book of safe, private internet browsing. Highly recommended.